By Alan Govenar & Osceola Mays, Disney Press. The Boston Globe-Horn Book Award winner. Young adult. Writer Alan Govenar spent 15 years talking with Osceola Mays, an African-American woman born in Texas in 1909. He has selected and edited these recollections to recreate what life in rural East Texas was like almost a century ago, from the viewpoint of a young African-American girl. Topics included are Mays’s hometown, being baptized, slavery, segregation, sharecropping, the death of Mays’s mother, and school to name a few. 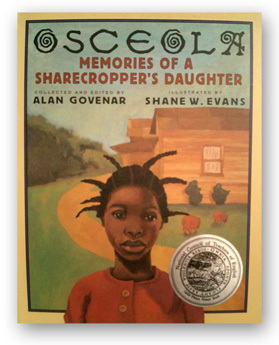 Evans's portraits heighten the drama of each memory, showing a grieving, motherless Osceola facing away from readers as she looks through a window frame. Other illustrations include Mays’s baptism and a portrait of her sharecropper father, dwarfed by the long rows he had to plow. This historical view is a significant part of America's past.